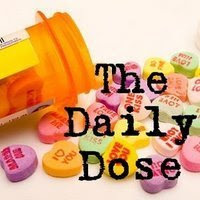 Out Of The Mouth Your Heart Speaks: Daily Dose Award! Today I was scrolling through my Sister's Blog because I wanted to Show him Mica's Vintage Kitchen Scale and I found an Award that she gave me in January That some how I missed! Wow Mica Thank you so Much! What a great treat today ! I love you and I am inspired by you! I would like to pass it on too, My Mother in Law Patti @ Treasure Barn, Jeanenne @ Love Conquers All and Jeanie @ Whispers of Inspiration, I truly appreciate All that you do and Say to Me, and I look to you for the Daily Dose. Thanks for the award Lori. Congrat's on your award...YOU deserve it!!! ps...so sorry I've not yet responded to your last email...it will be on the way this afternoon. "THANK YOU..THANK YOU SO MUCH LORI!!" This is so sweet of you to award me!! I hope you and your family had a Wonderful and Fantastic Easter!! Your such a sweetie! It's been so much fun to read your blog. I love some of the things you've given me to think about!